The Micke Grove Zoo Education Department is offering a variety of programs for toddlers, young children, and families. Explore your Micke Grove Zoo in a way you have never seen it before with the help of talented education staff! 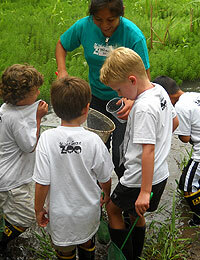 Zoo Members receive free or discounted registration for most Education Programs. Programs can be booked and paid for online or by calling (209) 331-2138 Tuesday-Saturday between 8:30AM and 5:00PM. Take your toddler on a WILD adventure, learning through doing. This program is all about touching; feeling, moving & exploring. Tots are engaged through a variety of hands-on activities such as art projects; games; crafts; stories & possible live animal encounters depending on the topic. Cost: $10 per pair (zoo members); $15 per pair (non-members)*. One additional participant is $6 for both children and adults regardless of membership. Registration: Please contact the Education Department at zooed@sjgov.org or call (209) 331-2138 between the hours of 8:30AM - 5:00PM. You may pay in person or mail a check within 7 days of your completed registration. * Pair includes one child and one adult over 18. Zoo admission included. Infants remaining in strollers or carseat allowed for no additional cost. Parking is included (free for Zoo Members with Membership Card). Register for one, two, three or all of the Micke Grove Zoo Tots Programs! If you find the link below not working, please contact the Education Department directly at (209) 331-2138. Micke Grove Zoo offers very special, award-winning birthday parties for children ages four through ten. You will meet live animals from the zoo education program, learn interesting animal facts and create an enrichment project for our zoo animals. These birthday parties are environmentally friendly and educationally fun for all. Click here for information. It's time to sign up the kids for 'Summer Camp at Micke Grove Zoo. Please use the link below.